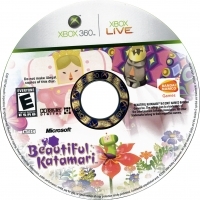 Description: The first Xbox360 entry in a series of strange "katamari" games. The premise of the games is that you are the Prince, and to appease the King of All Cosmos, you must roll around a ball gathering things that stick to it. The ball can only pickup things that are a certain proportion of it's size and smaller. You begin by picking up paper clips and erasers, and are soon picking up cars, people, etc. The larger the ball, the better your score! Box Text: THE PRINCE AND THE KING HAVE FINALLY ARRIVED ON THE XBOX360 VIDEO GAME AND ENTERTAINMENT SYSTEM! Once again the King of All Cosmos is in a dilemma and it is up to the Prince and the cousins to restore harmony. Roll up everything and anything you can get your hands on to create the biggest clump of randomness. It's chaotic. It's crazy. It's Beautiful Katamari! 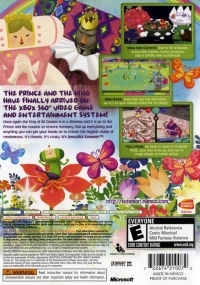 03-25-2018 price5474 Box Text THE PRINCE AND THE KING HAVE FINALLY ARRIVED ON THE XBOX360 VIDEO GAME AND ENTERTAINMENT SYSTEM! Once again the King of All Cosmos is in a dilemma and it is up to the Prince and the cousins to restore harmony. Roll up everything and anything you can get your hands on to create the biggest clump of randomness. It's chaotic. It's crazy. It's Beautiful Katamari! 08-08-2012 mkarasch Description The first Xbox360 entry in a series of strange "katamari" games. The premise of the games is that you are the Prince, and to appease the King of All Cosmos, you must roll around a ball gathering things that stick to it. The ball can only pickup things that are a certain proportion of it's size and smaller. You begin by picking up paper clips and erasers, and are soon picking up cars, people, etc. The larger the ball, the better your score! 08-08-2012 mkarasch Box Text THE PRINCE AND THE KING HAVE FINALLY ARRIVED ON THE XBOX360 VIDEO GAME AND ENTERTAINMENT SYSTEM! Once again the King of All Cosmos is in a dilemma and it is up to the Prince and the cousins to restore harmony. Roll up everything and anything you can get your hands on to create the biggest clump of randomness. It's chaotic. It's crazy. It's Beautiful Katamari! 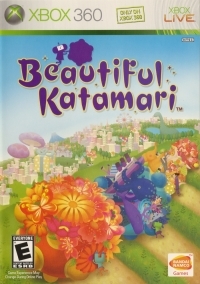 This is a list of VGCollect users who have Beautiful Katamari in their Collection. This is a list of VGCollect users who have Beautiful Katamari in their Sell List. This is a list of VGCollect users who have Beautiful Katamari in their Wish List.